In 2012, I had a question: where are the skateparks in Accra? I didn’t get a satisfactory answer. 5 years later, this question might just be answered. If we successfully fund a proper skatepark in Accra that is. Growing up, there was a lot of highlife music around me, but somehow, I wasn’t drawn to it. This was probably because in my mind at the time, I translated highlife into “old people’s music.” What better way to spite your parents than to detest what they love? This meant that regardless of how much the rhythmic sounds of highlife music moved me, I didn’t get my boogie on. Okay, maybe privately but definitely not out in the open. Sadly, I didn’t really get down with the genre although I always recognized the sound as a unique, Ghanaian creation. Nowadays, I am crazy interested in highlife but I hit a roadblock after listening for a while with so much hip hop and electro knocking my cranium. Alas, my appreciation for highlife is avid while fleeting. Thank goodness for Yung Fly, the steady rising Accra producer, whose innate joy for classics and skill for transposing those classics into dope, new soundscapes sets him leagues apart from his peers. Check out Yung Fly’s work below. I’m in my word processor. Life is moving so fast, sometimes too fast that we can’t actually keep track. Maybe that isn’t entirely true, ECG tends to remind us more times than we can thank the universe for, to appreciate stuff going on around, however mundane or exciting. Have you ever paused to consider the “what ifs”? What if ECG didn’t exist? How would we draw power? Perhaps we would rely on the sun and our current load shedding idiocy would be non-existent? Or like a friend had me thinking, more people could work from home since there is an abundance of electricity or better, a reliable power supply schedule? Imagine if we had the freedom working from home, the flexibility, the ability to get right to a task as the inspiration rains down in torrents. Imagine how much traffic there would be in town; I could ideally get from Airport West to Accra Central in a matter of minutes at ten in the morning! That will however affect the many hawkers reliant on passengers for their daily bread. Then again, given the abundance of no hawking here signs in town, lots of lives can be saved in the long term. No more risk of death by motorists, from fatigue – hawkers deserve an award for the amount of energy they exhaust just to earn very little income – and very importantly (to me anyway), their humanity. Urgh! Damn this power cut. Pause, what if we set up a school that focused on technology, surely, they would find solutions to problems as important and yet basic as electricity provision. Oh hang on, there’s KNUST. I wonder what scientific theory is being taught. Hopefully, like magic, our problems would be solved. I dunno. Pause, man has been on the moon. We’re men too aren’t we? I’ve heard of no black man that’s been on the moon or in space for that matter; definitely no Africans and as real as the power of ECG is to any Ghanaian (excluding Roman Ridge residents), no Ghanaians; be it via a space shuttle or “nye bro” prestidigitations. I’ve been in my sneakers all day, I need to take them off. Where is my chale wote? Ha! Chale Wote! Pause, there’s beauty all around us; it just takes perspective to see it. There is beauty in art and art is beauty. Do you follow? (I think I lost myself there somewhere). 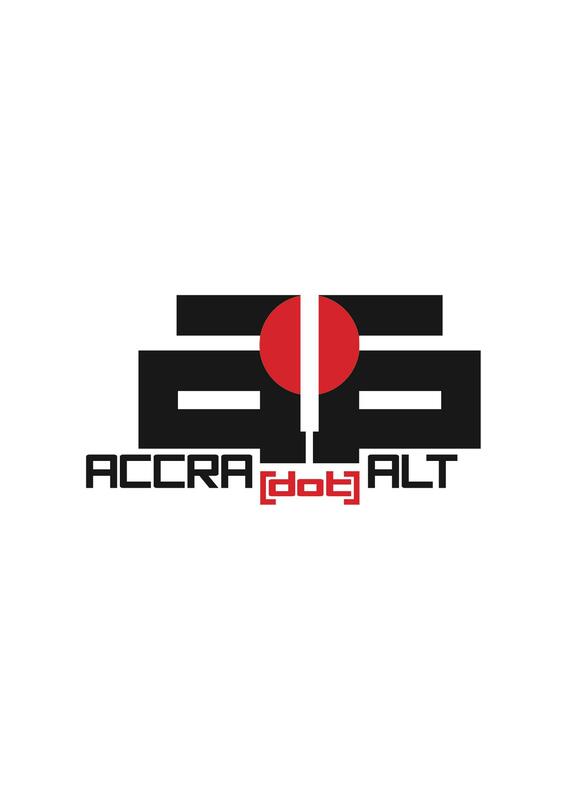 What if the Chale Wote Street Art Festival didn’t exist? That means I wouldn’t see a really dope, artistic impression on the bland, cold blooded, infuriating, degrading and disrespectful “Remove Now” brand AMA so loves to write by Jason Nico-Annnan. The artist gave life to the beauty that is Ama. Note, Ama is the person and AMA the defilers. Pause, what if AMA actually did their job and properly allocated land titles and deeds and whatever nifty paperwork they are mandated to attend to and did away with the back enveloping and palm greasing, there wouldn’t be the need for artists to impress on their boring trademark right? Even better, property owners won’t be baffled by the “Produce Permit” trademark either. I’m just saying. Wale‘s Ambition boomed through the speakers. The feeling was all gee. The night was crisp; it wasn’t chilling, it was just perfect! Two prison’s officers, all geared up, dark shades on, buff [you knew they weren’t to mess with] led the pack. A pack of hungry wolves? Neh! This really cool looking pack, all fresh and macho, adorned in yellow t-shirts, repping hard for Best Bargain GH, who in turn affiliated and repped even harder for the ring master and Lord, towards his mighty throne. A true Lord, the yellow surrounded and cleared the way for him as only a king should enjoy. Reaching the ring, the ropes were pulled down for as he made his way into the his ring. The announcer did his job, the ref did his job, the king and his slave agreed to be fair to each other in their display of sportsmanship, strength and agility, the power dynamics were set in motion and it was on! 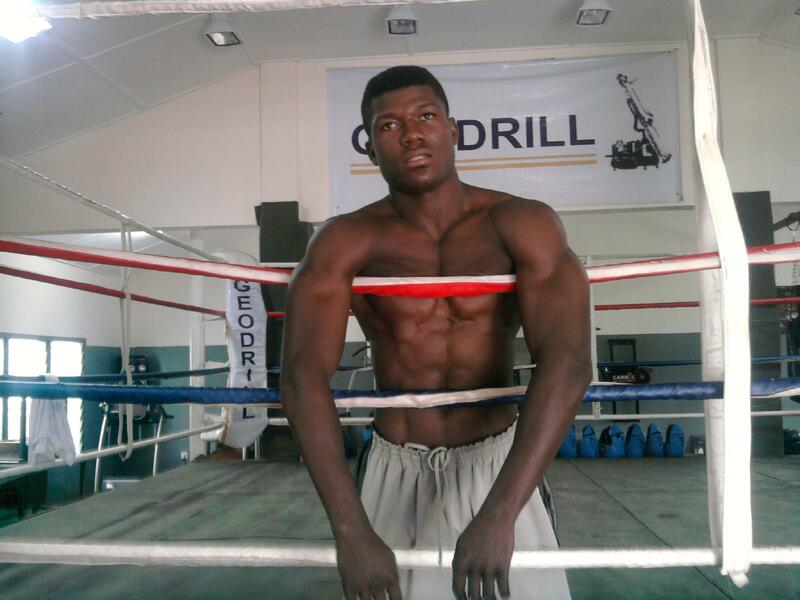 Blue corner the king, the other corner Daniel “Sunday King Hammer”Adjei Sowah! Ring goes the bell. The king only knows victory, and victory is what he had come for. But oh ho! This tool [hammer] had no intentions of going down easy. Sheer perfection! He jabbed, threw his fist, a left, a right, a combo, punched, all in hopes he might faze the king so as to leave an opening to guarantee his name is etched in history as the privileged one to have clobbered and hammered the king. Wickedly he jabbed, he was furious, vicious, did he have a personal vendetta against the king? I can’t tell; but boy did he try. Dude! Are you gonna throw a proper punch or what? Only thing wrong? He was simply fodder for the Lord of the Ring. The Lord after all did say, “I will never stand and trade punches with my opponent in the ring but I will beat him”. The king must have gotten bored with the insects charade. A quick lesson or two on how punches are thrown later, SKH wished he hadn’t enrolled in LOTR school for Winners. A left, a right, a combo, no one could tell which was which, whether that was a right or left hook. Wait what was that? It was so fast, I could swear he punched with both hands. The combos were unceasing and relentless; if christians could only learn to pray this way. Not so tough anymore the slave, lesson upon lesson on modesty the Lord taught. But no, the other corner wanted to prove he knew better and acted stubborn. Left, right, left hook and his entire anatomy was on the floor; how he didn’t convulse and pass out, beyond me. People just don’t learn. He actually fancied a comeback chance with the Lord; the impunity!The clock was ticking, it was nearing the sound of the bell, break time was nigh upon us; well mostly upon SKH. The Sunday King Hammer had become the anvil, clobbered down by none other than a king. Meanwhile, on the birdwatch network, Lord Aqeel had earlier chirped tweeted he would end his lesson in the third round. Back to the countdown: 10, 9 … the lesson finally set in. 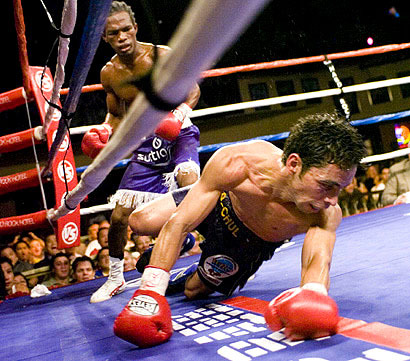 Sena Aqeel “Lord of the Ring” Agbeko had within the first round and rather effortlessly, continued his streak to fifteen (15), wins all by KOs. Is there a match for the L.O.T.R.? As one lover (no, not that kind) of the Lord puts it, the fight was so quick, the cameras ( mind you there were about four) were unable to capture it. Xoxo. The team was estatic. His team, crew, support, family, pack, procession stormed his ring to hail their champ, it was all pride and glory as always for the “Lord of the Ring”! Check out the Lord, Sena Agbeko here, here and here and also follow his updates here, or look at photos of his life here. 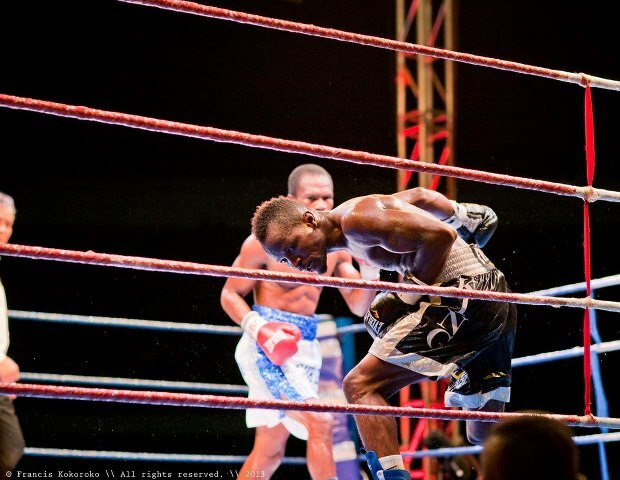 Pound for pound is how it went down last night at the Accra Sports Stadium as 7 bouts went down. 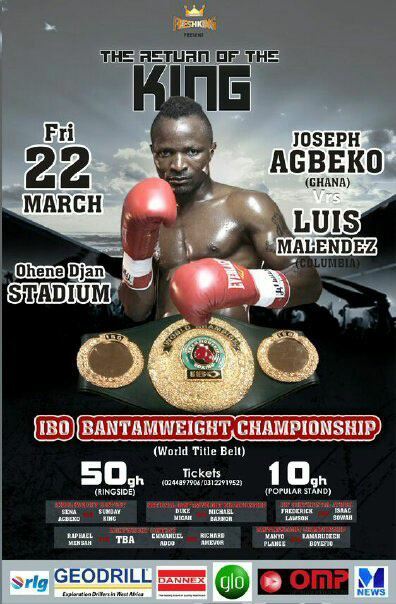 Anyway, Joseph King Kong Agbeko defended his IBO Bantamweight title last night against Luiz Mendelez from Columbia. Was it fun? Yup! Chale, from what I heard by way of mouth and from the little googling I did on K. Kong’s opponent, I bet K. Kong expected the fight to be a walk in the park; it was not! For a moment there I thought he would actually lose! Like really! The consensus I gathered that night was that, K. Kong won mostly because he had more stamina. But damn, Mendelez was tough! And very confident too. Can you imagine fighting someone on his own turf with but a handful of people behind you? So hurray, Ghana ,through K. Kong retained her championship. Good! I thought he would actually lose! Like really! So along with #teamaqeel , I arrived at the stadium pretty early, like around 7. Stuff was still being set up chale. At least when everything punched off, the ringside was pretty much star studded, and of course, star packed! The popular stands were also vibing with “jama” which I’m not so sure could possibly motivate anyone. Oh well.. So yeah, big ups to Fresh Kings Promotions (Entertainers), OMP and all who made this happen. Some smart alec decided it was ok to place both projectors meant to serve the fnas in the popular stands on only one side of the pitch. Well at least someone fixed that. It wasn’t after the second bout that they begun to change the postion of one of the projected screens to benefit fans on the other side of the stadium, which ironically, had more people. Fight was scheduled to start at 9, don’t even ask when it kicked off. A (if you may) rooster was prepared, clearly stating the order in which the fights would occur. Followed through on the first three bouts, the rest, let’s just say I highly doubted all the fights would come on. K. Kong’s fight was scheduled to be last, the crowning fight, the highlight. My reasoning tells me this is to give the other boxers billed to fight their own spotlight as well; all in brotherly sportsmanship love. 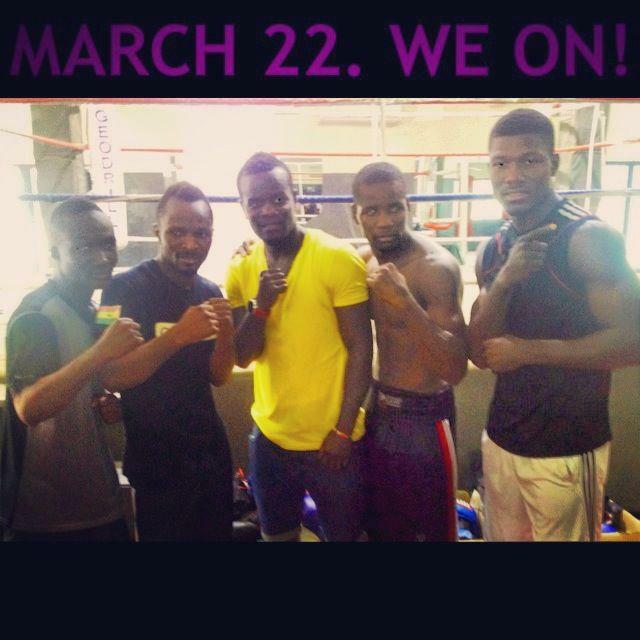 Luckily, we got to see Manyo Plange, one of the featured boxers fight before K.Kong. That dude is viscious! Of course he won; I think by T.K.O.! Then on came K. Kong. I wouldn’t speak on him because all the headlines are abuzz with him anyway. But chale, that “Columbiano” was persistent! Oh did I mention Samini sang our national anthem? Anything special about it? Nope!! I was hoping for some sort of rendition, but oh well! The Columbian anthem was sang as well, amidst boos, very typical and expected, in contrast with Samini’s which.. well you can imagine. After K. Kong’s fight, people just up’d and assumed the night was over. Don’t people listen or read? People can to leave after the champ had been crowned, totally forgetting there were other bouts to be fought. I don’t blame them. They had seen what they came for. Only true boxing fans stayed on to watch the other bouts. And by that time, the gates were opened and as you can well imagine, everyone trooped in to the ringside! An awesome experience for them I can imagine! 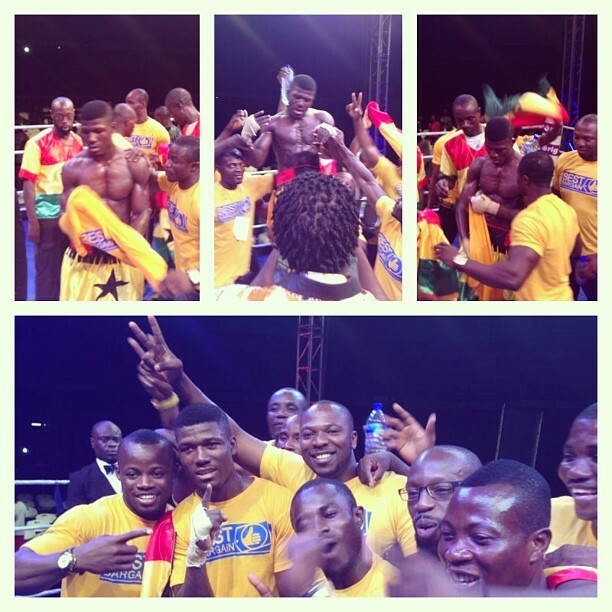 Frederick Lawson won his fight, clinching the IBF Continental Africa Welterweight title. Then on came Duke Micah. Now that was enjoyable. 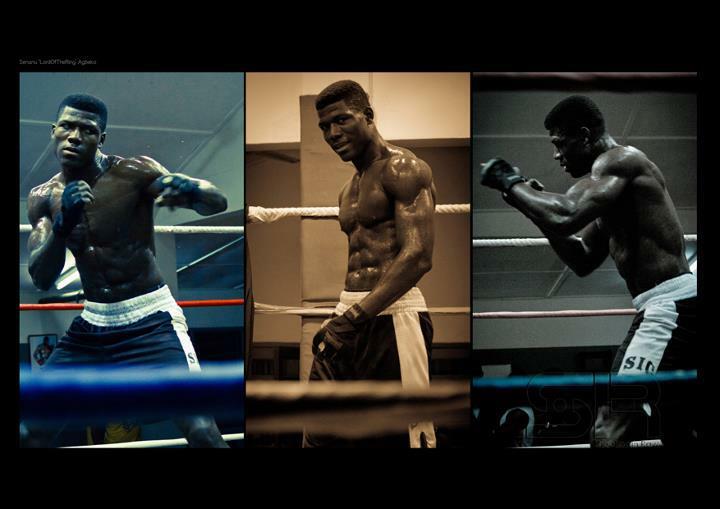 His opponent (Michael Barnor) put on good show along with him. Duke emerged winner. Oh well, last night was great!